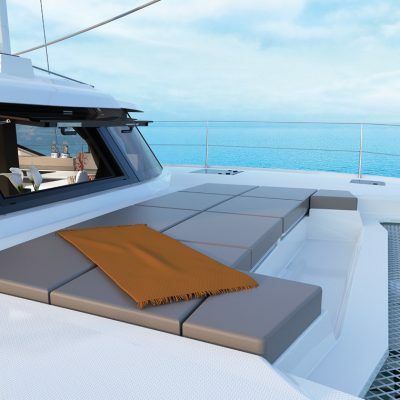 Setting new standards in the 45 foot luxury catamaran market. 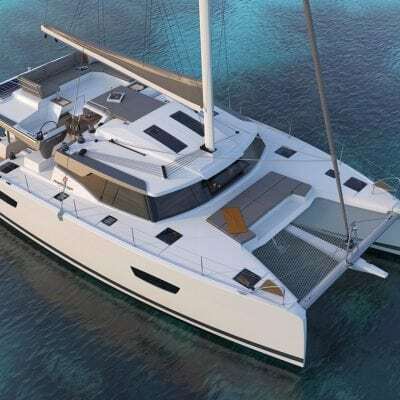 Unveiled in September 2018 and due to launch in 2019, the innovative new Fountaine Pajot 45 is going to create new industry standards in the 45 foot luxury catamaran market. 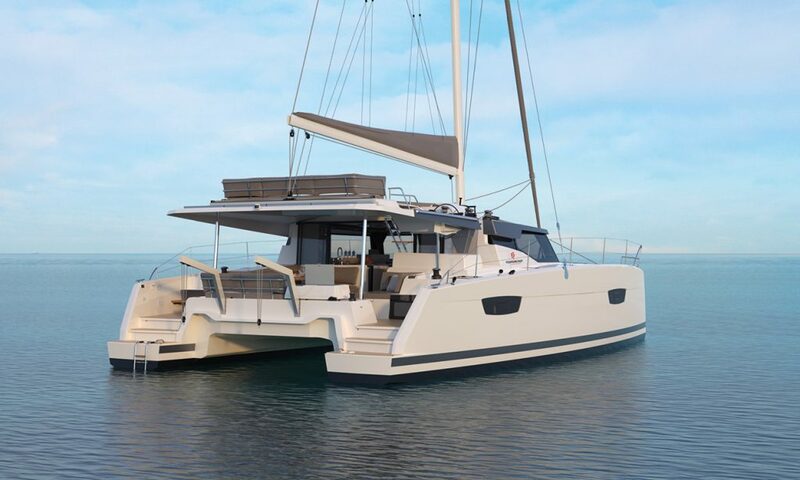 Fountaine Pajot’s signature inverted bow and flared hulls give an elegant and dynamic line while maintaining remarkable interior space. 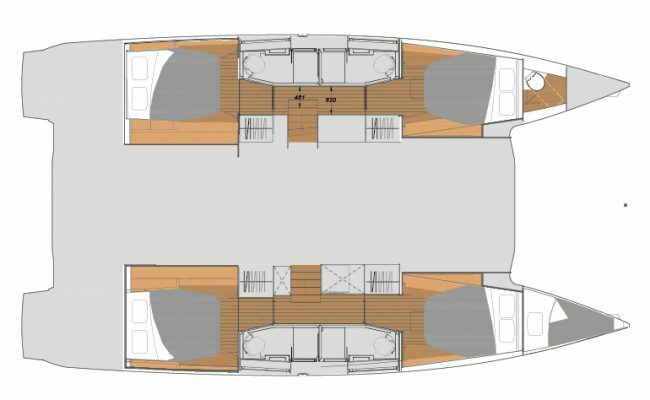 The forward lounge at the bow, an enormous upper deck fly-bridge, and an expansive sun-bed area on top of the coach roof offer extensive exterior relaxation space. 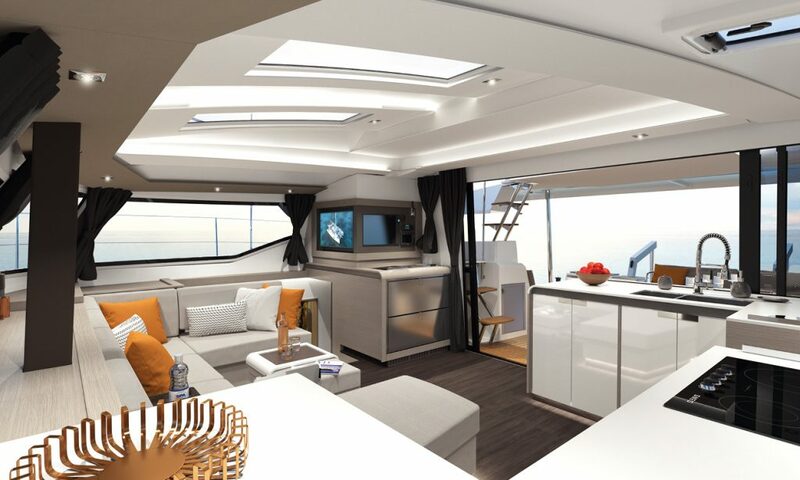 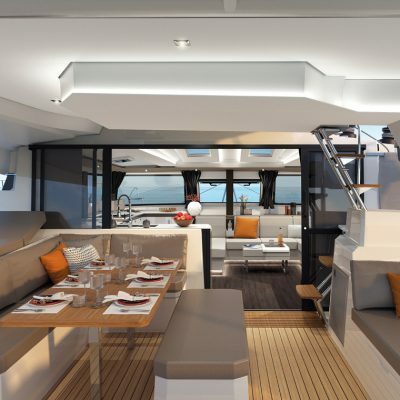 The largest saloon in her class, together with an innovative galley layout, coupled with abundant light and ultra modern décor bring exceptional quality to the interior. 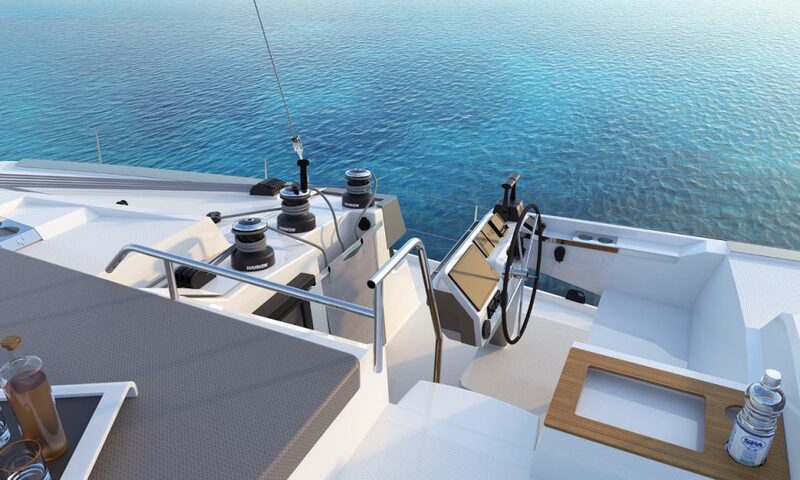 The newly designed helm station will improve handling and bring increased comfort for longer distance cruising. 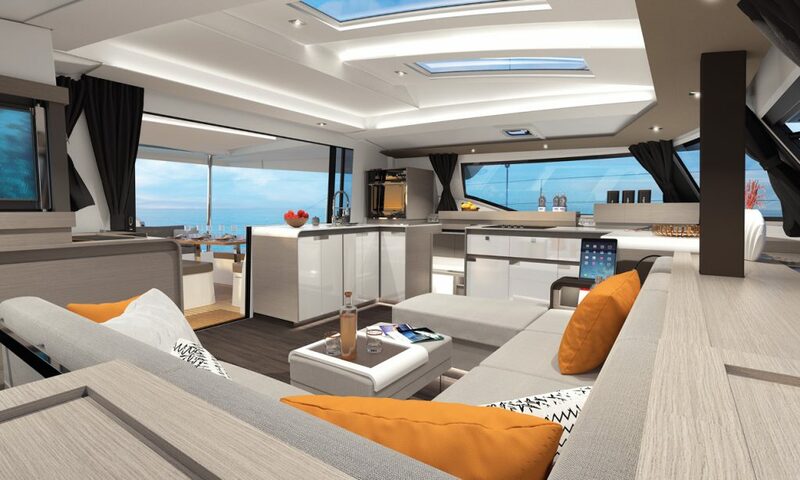 The successful ‘beach club’ tender-lift, integrated BBQ, extended cockpit table and crisp and contemporary styling below are just a few of the other highlights. 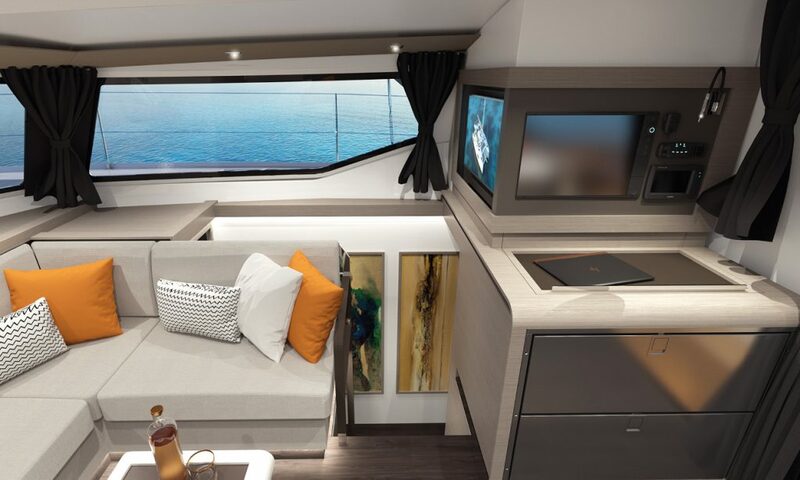 If you would like to place and order or simply find out more about the new FP 45 contact us here, or email Robin Hodges, our yacht sales manager. 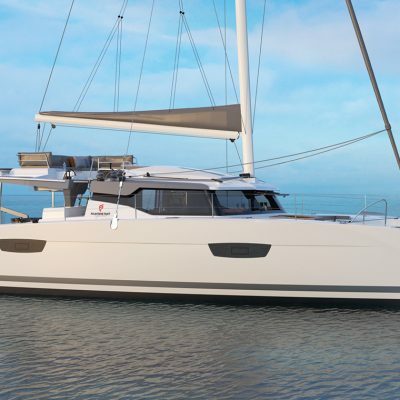 robin@horizonyachtcharters.com Or please scroll down to read more about this remarkable catamaran. 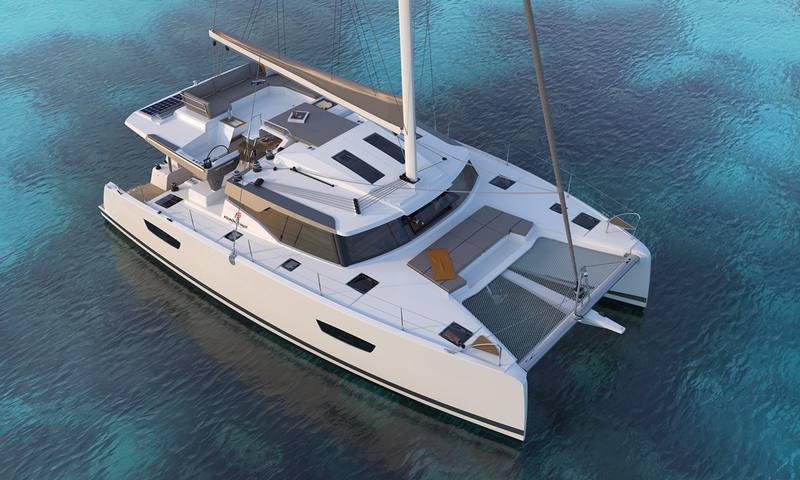 As with the Astrea 42, the new 45 is outstanding in encouraging interaction between helm and everyone on board. 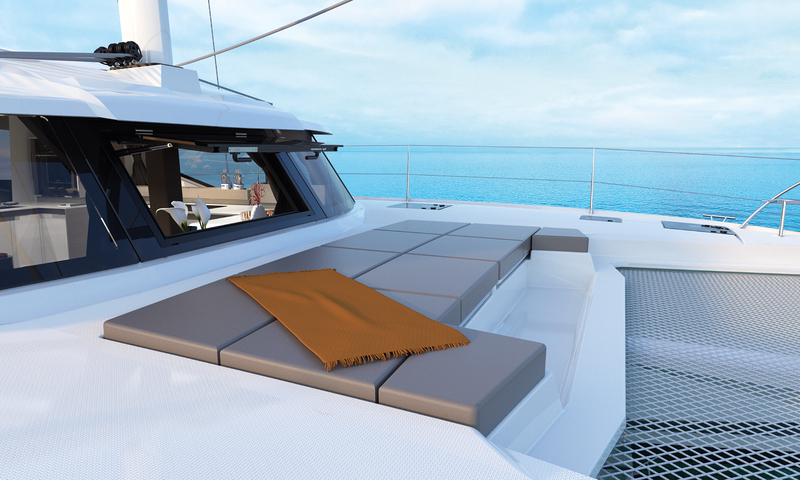 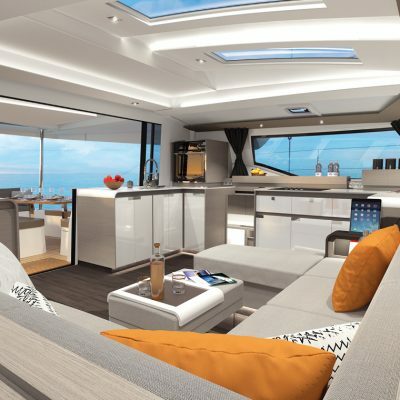 The cleverly designed outdoor living space offers natural flowing dynamic and easy communication between helm and cockpit. 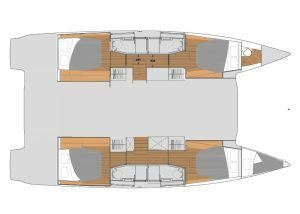 The L-shaped settee around the table and new fixed central seat in the middle of the cockpit results in comfortable seating for 8. There is a bench seat across the transom and a seat for lounging to starboard, as well as a fridge under the stairs to the helm for easy access to refreshing drinks. 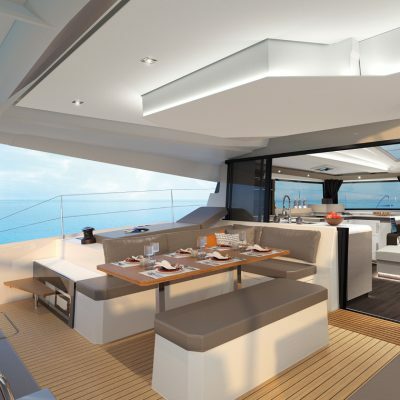 At the bow there is another lounge area and trampoline giving a marvelous secluded relaxation area away from the bustle of the cockpit. 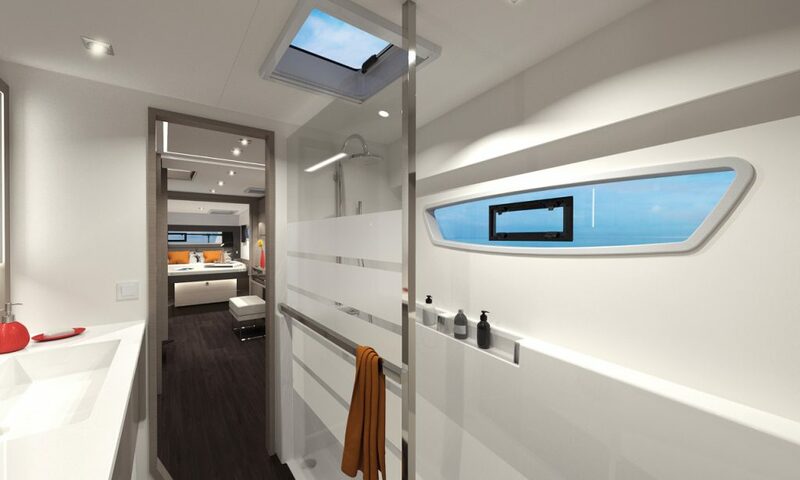 The the very neat optional electric tender-lift not only makes handling the dinghy effortless but also lowers to provide a generous swim up bathing platform. 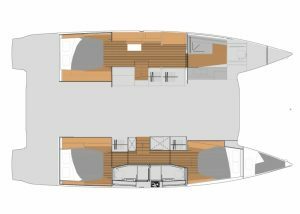 The ‘Beach Club’ as it is affectionately known. 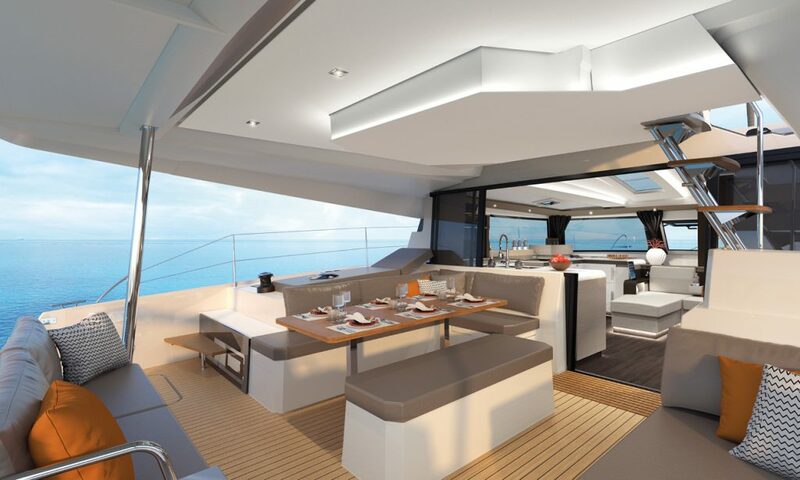 The open design saloon has skylights and high panoramic windows that bathe the interior in natural light, and a large single opening window forward brings masses of ventilation. 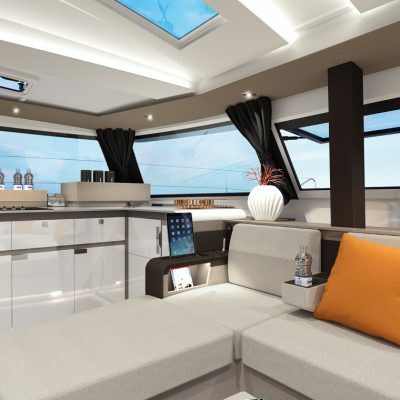 The U shaped lounge settee, with a large centrally located ottoman style seat is exceptional and with the option of a low coffee table opens the whole room. 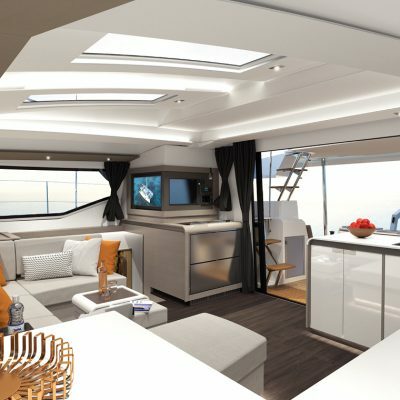 Her innovative galley transitions seamlessly with the cockpit courtesy of a vast fully retractable sliding door and window. 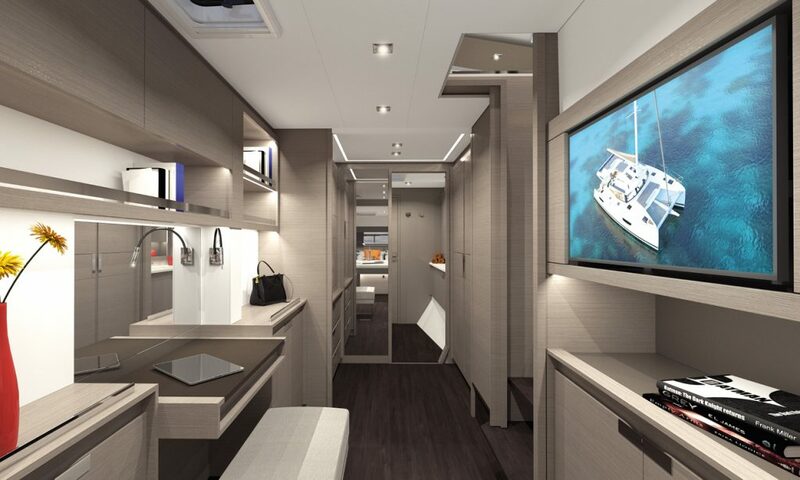 The galley itself extends all along the port side offering generous storage and vast amounts of counter space. 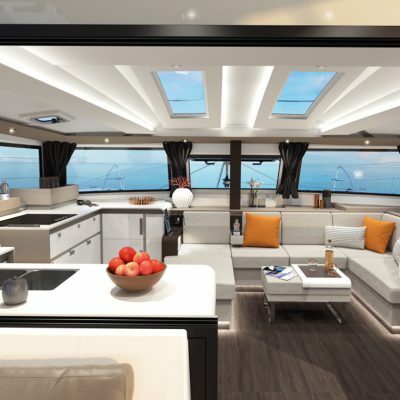 The double fridge is to starboard with the counter level oven to port, both set before the central companionways to the hulls. 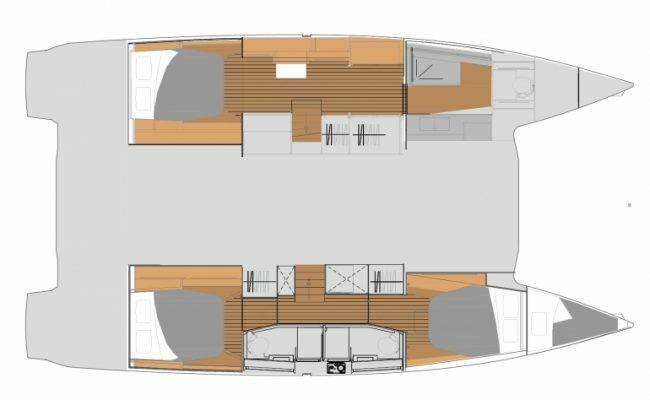 As with other FP’s the Astrea’s available in multiple cabin configurations, including three- and four-cabin layouts and, depending on the version, can all have ensuites. 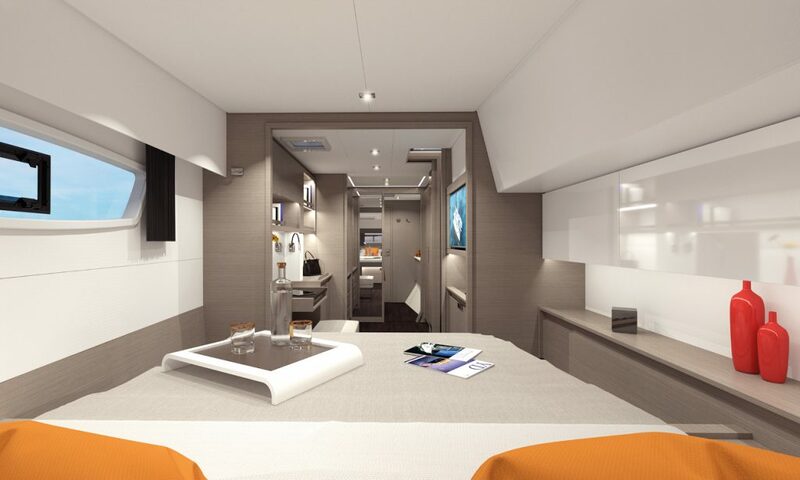 The three cabin Maestro version sees the entire port hull configured as a master suite. 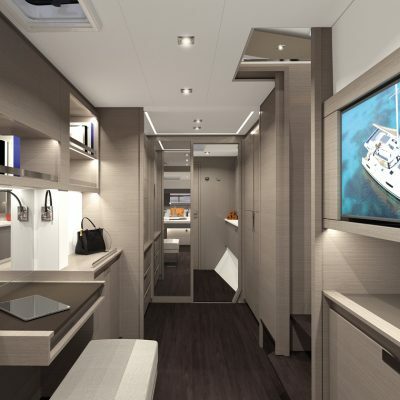 This comprises a large double island bed aft and a very generous bathroom with cleverly designed separate shower up front. 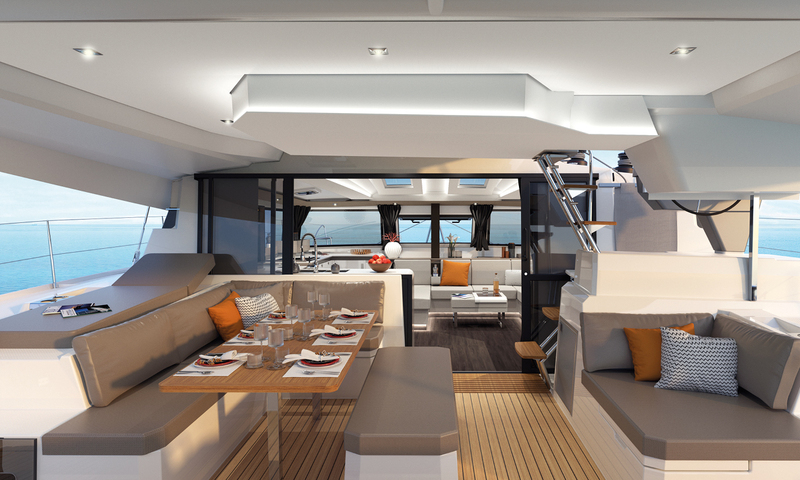 (as you see on the Saona 47). 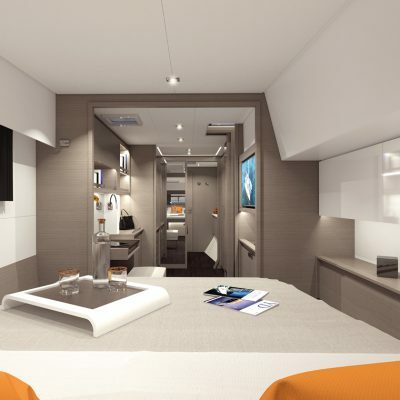 The four cabin version offers large fore and aft double cabins with en-suite bathroom. 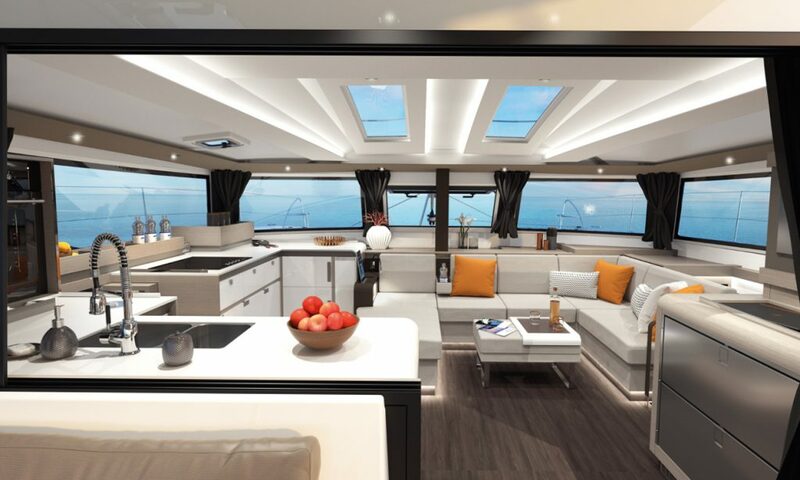 Large hull windows and hatches bring plenty of natural light. 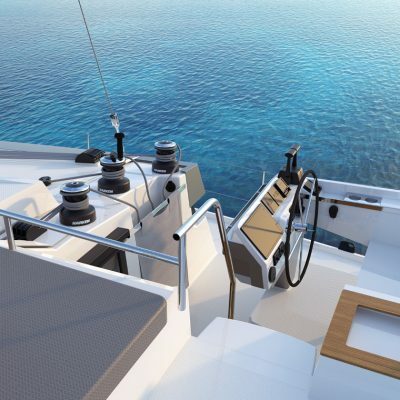 The mainsheet traveller mounted on the cockpit roof, immediately aft of the helm station, helps with trimming the mainsail into its optimum shape. 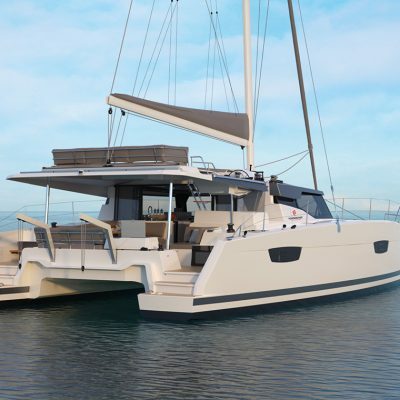 The boom sits relatively low and with the expansive coach-roof stowing the mainsail into its bag is easy. 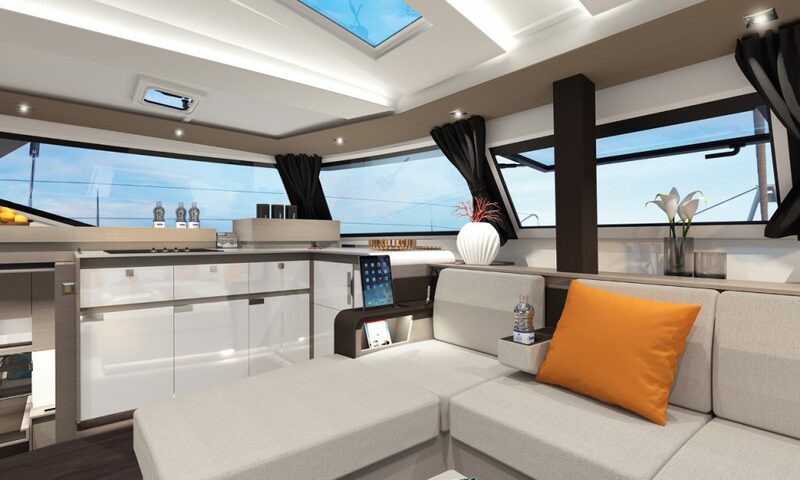 Also with the extended coach roof there is space for solar panels behind the traveler. 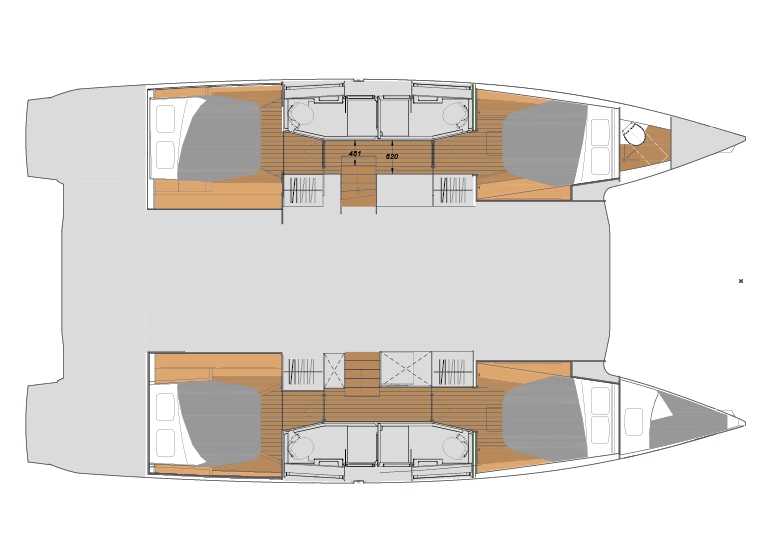 The genoa is sheeted through cars positioned will inboard on the coach roof giving decent sailing angles upwind, and an optional bow-sprite and genaker will enhance the off-wind sailing experience. 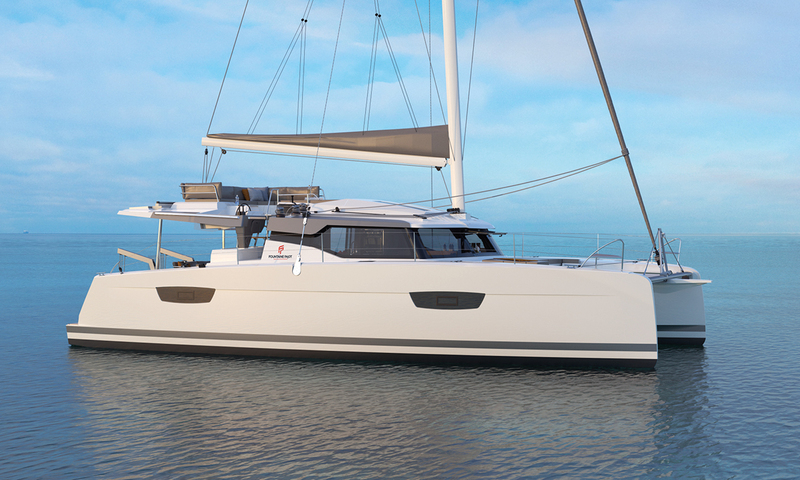 This 45 foot catamaran offers multiple options for personalization. 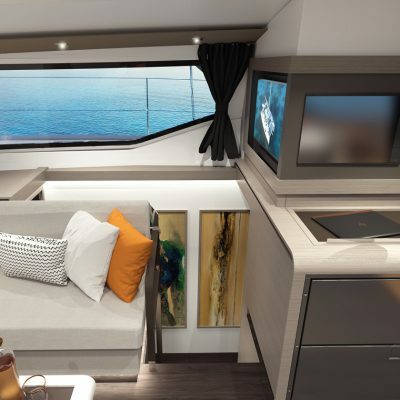 Water-maker, Dish washer, tender lift, solar panels, upgraded engines, TV, electrical multifunction interior table, and 7 types of upholstery are just some of the options you have to make this fabulous catamaran your very own.